If one dht is good, two must be better? I don't know. Some people like combining 6C45 etc with DHT, supposedly mixing the appealing qualities of each. Other people find that using a 6C45 (or other high-gm tube) with a 300B just makes a 300B sound like a 6C45. The DHT-DHT route (DHT driver) is very complicated and laborious. The results can sometimes be 'too colored." For other people, it is like combining roast beef with a good burgandy. It seems that many people these days have shied away from the high-gm driver tubes (6N1P paralleled, etc.) in favor of DHT-DHT amps. I am presently using 01A-71A-10Y-45. I would suggest that, if you're going to do some DHT experiments, try DHT-DHT and maybe DHT-DHT-DHT. 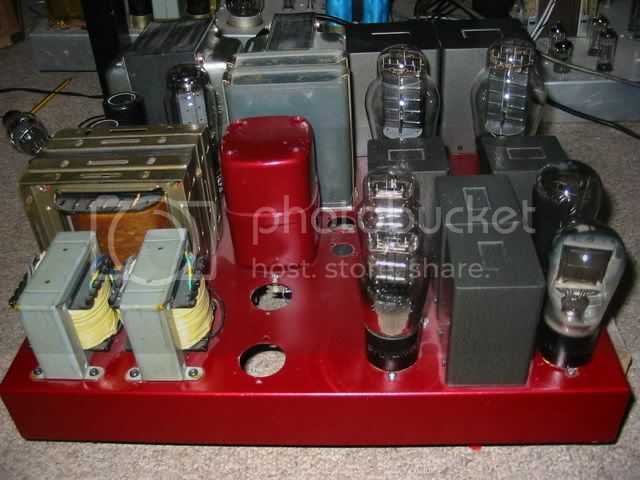 If you use an IHT, maybe 6SN7 or other 1940s "classic" tube rather than a 1960s high-gm model. Something like AV20-PX25-300B can be good. Otherwise, maybe 6SN7-10Y-2A3 for example. The AV20-PX25 combo can make a good two-stage amp if you don't need a lot of gain, such as for a horn driver. Even 10Y-PX25 will have about the same gain as a 6E5P or 6C45 used single-stage. Anyhow, the Melquiades does have some “tricks” in the realm of dynamic viscosity. It is what make it quite different in term of Reality Reconstruction as I feel that propagation of sound via air does not have linear “audio dynamic”, soft of speaking. I would like to know if you can explain a bit more the idea of dynamic viscosity. Is it similar to the sound of the Sansui TU-X1? I find it has a character which is softly accurate, gets the amplitude of the dynamics correct, flows without emphasis. Is this what you mean? I do not use the 300b now. I use the 2A3 circuit, which I prefer as it is less thickly colored. In my system now, I recognize it can still improve the accuracy of the dynamics and overall stability, but mostly I am looking to preserve the chaotic liveliness you describe. I believe it may be something lost with homogenization of the circuit rather than added/injected, but this remains in question. I would agree. Perhaps lest “soft” materials involved means less opportunities to do “colors”. With the single stage amplification perhaps the same but it very educational to hear MF driver with a single-stage of amplification, particularly with very fast core. It strikes me as very “honest” sound; it has a sense of purity and cleanness that is very addictive if you get use to it. What important is to understand that usually the phrase “clean” sound audio people use only in context of “lean” sound. The Milq’s single-stage doe not sound lean at all, rather just “full” but “clean”. The 6C33 has some adherents, including Lamm and also the well-regarded Almarro amps. However, even Lamm is now using the GM70 for his $140,000 statement amplifier. I never trued any gainclone amps in my own playback and therefore I have not reasons to protest. The last gainclone that I heard was last year were 4-way system was driven by 4 or 5 47Lab amps, that are gainclone I belive. I have used Russian high-gm tubes like 6C45 in amps before, including single-stage designs very much like Romy's single-stage Milq. These have many attractions. However, in my experience it just didn't have the tone. Jim de Kort of VT52.com came to the same conclusion, regarding his WE437 spud using amorphous output transformers, on his 107db horn speakers. He went back to his 26-10-45 combo, three stages instead of one. In my experience, a very simple 6sn7-6sn7-45 amp destroyed the 6C45 spud, even with the disadvantages of three stages instead of one. Interesting… Still, I do not think that the idea to go three active stages to get “some colors” is something that sounds logical to me. I like to use as less stages as possible. It shell be “other ways”. In fact I do have some interesting ideas and not those that that I have expressed in my post above. The 6E5P is a perfect two-stage driver (low current and high voltage), it is not out tube. You remember when I was trying to have 6E5P to drive headphones – it was not good. I thought and still think that it is possible to use 6E5P of the 6C45 in the DSET configuration, letting it to drive just HF channel. If it has glassiness then load it harder and it might go away. Yes, the Carver’s fame did come to my mind and I certainly do not go into the same camp - I hate whatever he did. Well, I understated all of it but my mind works diffidently in audio. I do not feel that going for some kind of “magic” vintage tubes is a direction that I would feel too enthusiastic. In many instances the “special” reported qualities of DHT tubes are due to the fact that in IDHT cathodes are large fixed and heavy but in DHT they are light and flimsy wires. Those wires, being driven by filaments (particularly by AC voltage) are shaking and create modulations that randomize the electrons flow in DHT. Also, in DHT the electrons flow dispatched not from uniformed nice cathode but from many 3-D wires that make the arriving to anode not… time-aligned and more unsystematic. BTW, this is one of the reasons why many DHT people prefer the 50-60 years old tubes – older tubes have more “hanged” cathodes that got longer by gravitation and consequentially have more room for “shaking”. If to look at the subject slightly deeper then it would be obviously that some things might be “done” with it. I will be doing next weeks two very interesting experiments that might tune out to be very promising. I don't mind talking about the "soul" of tubes. In my experience, the Kron 2A3 is vastly better Sovtek, etc., and better than NOS RCA 2A3 in my opinion. It has much more "soul" -- to the extent that listening became rather dull without it. I was shocked to discover how much more "feeling" and "emotion" was expressed by one apparently-identical tube compared to another. Some people have reported the same thing from different makes of rectifier tubes! I would guess that people who make fun of others talking about the "soul" of tubes have not had this experience. I do not make fun of the people who talk about the "soul" of tubes. I just say that for the objectives that I have there is a difference between cataloging and reusing “souls” and creating the “souls”. Any “soul” of not-alive devise was created and put in plat by engineers. I see no reason why it can’t be done in my turf and folowing the rule of the game that I am willing to play. Also, in DHT the electrons flow dispatched not from uniformed nice cathode but from many 3-D wires that make the arriving to anode not… time-aligned and more unsystematic. BTW, this is one of the reasons why many DHT people prefer the 50-60 years old tubes – older tubes have more “hanged” cathodes that got longer by gravitation and consequentially have more room for “shaking”. If to look at the subject slightly deeper then it would be obviously that some things might be “done” with it. I will be doing next weeks two very interesting experiments that might tune out to be very promising. Experimenting in manipulating the physical characteristics of DHT thermiotic emission? It also links to the question of why power conditioners change the sound but usually do not make it better. Can it be that some microscopic physical movement, and perhaps specific classes of vibration can have positive results on audio, while others are negative? Thus, power conditioners "throw the baby out with the bath water." Perhaps introducing random noise to create physical vibration in the electronic structures, but eliminate unwanted resonances? OK, here is an easy homework: how to randomize elections flow but do not create microscopic? The answer is actually contains in the question. The answer is one of the solutions that my first thing that I will be trying sometimes. The second solution that I order of magnetite more enthusiastic about I will keep for a time being secretive but is it work then it will be the most ridicules and the most affective idea that I have seen in tube amplifications. BTW, NL I do not know your playback and therefore ask. Using your sausages of the DHT, do you DSET them of you drive with 45 amp the whole range? If you bi-amp then what you use at the bottom? I have reasons to ask I have some concerns. Old valves have more soul! 112-71-300B works for me although I sometimes use some 845 PP amps for the lower frequencies. Was it soul or soil? Well, I have to admit that I feel that those conversations about the “soul” of the vintage tubes bring conversation and actions absolutely to nowhere. Yes, I have to admit that there was a special magic riding a horse pulled wagon but we for very strange reasons use today the air-conditioned contemporary automobiles. I have to also admit the ascent in air balloon has a very special feeling but we chose to travel by airplane. I have to also admit, and a I know that many people will not like it, that any of my own exposure to the practical achieved sonic result of the people who not just used the DHT but expressed in absolute importance of DHT lead to me walking out of their listening room literary laughing. Interesting that laughable it was not as much Sound itself but rather the absolutely idiotic in my view faulty premises that they used to built their playbacks. Did I witness interesting Sound with DHT-stressed applications? Well, my problem was that I did not witness any serious objectives in the minds of the DHT-stressed system owners and that is my problem. I certainly do not associate the primitivism of playback objectives with admiration of “soul of vintage tubes, I juts report what I was exposed to. I still would like to experience as serious installation with explicit use of old DHT that would me more then exercise of the syrupy paranoia. Saying that I would not denying the presence of a special character of sound with some older DHT, the question is: are we playing to the “special character” or we are willing to creatively use this character without our own special objective for sound reproduction? Now, we are multiamping the system complimenting the MF-only DHT with IDHT LF and HF channels, of like Guy does with 845PP amps (let pretend that 845PP does not have this “timing randomness”). So, will the DHT’s randomness manifest itself in this application? The “timing” marks might be very much defused by IDHT’s timing in this case. My theory is that the “timing randomness” is the specific collapse or a specific build up of particular harmonic pattern right before or after the signal changes it’s dynamic pointer. Would the presents of other channel that does not comply with this “specific collapse or a specific build up of particular harmonic pattern” be a wrecking the effectiveness of “timing randomness”? Don't take the 'soul' comment too seriously. I just needed a heading! I haven't tried enough of the other DHT options to know whether there are better alternatives within that family. However, it has been my experience to date, that carefully using good examples of some of these older tubes (I'd also include the 10Y) can give very expressive, colourful & satisfying results. Perhaps in a way that newer tubes haven't thus far. For me anyway. "Timbre Lock: This circuit enables adjusting the bias of each of the twin internal amplifiers separately in real time for tuning the interaction between the amplifiers and whatever loudspeaker they are connect to. These adjustments have a subtle but profound impact on musical articulation, high frequency smoothness and bass extension." I am interested that Romy has found some interest in But, if I wanted "neutral" I would use a gainclone-type amp. DHTs can be among the lowest-distortion amplification devices ever made. However, most DHT users like the funny addition they make to the sound, and tend to emphasize this aspect. Why do you describe op-amp based gainclones as "neutral"? Is this Romy's "neutrality" or a neutral/uncoloured sound (in fact, how could someone one day decide that distortion and colour are one and the same really puzzles me! What if we were to classify an image with chromatic distortion as coloured?)? I have had experience with an op-amp based amplifier and found it had a distinct signature (less so when using wide-range single driver speakers). In general, DHT amps are lacking in power, dynamics and bandwidth. Would this be the result of poor implementation or rather a feature of such technology? ..are lacking in power, dynamics and bandwidth. Timbre-Lock. Not quite ready for prime time. It kind of sounds good, but is all based on this false idea that you can cancel out Total Harmonic Distortion in your loudspeakers with "negative polarity" THD in the amplifier. It treats THD like it was a discrete variable rather than the sort of garbage heap of all sorts of forms of noise and distortion. However, there are various reasons (e.g., impedance) why a loudspeaker may match an amplifier, just not this one to that extent. I personally more inclined to have “accurate” sound and word accuracy is more implies to a playback accurately and fatefully render the essence of musical events. Pay attention – not accurately play the input signal, not accurately play “what the microtones heard”, but rather the accurately play what I feel shell be played and what I recognize is important in given played material. In many way to do so I need to start with impartially of playback and then to enable playback to do what need to be done. I doubt it, but it will certainly muddy things up, yes? Imagine an extreme analogy where we hook up just one channel of the LF out of phase. It confuses the picture but does not destroy the stereo effect of the HF (comparing to listening in mono to one channel). Yes, I know it is not a perfect analogy, okay. The VERY INTERESTING idea is that the introduction of noise as a dithering element for the analog signal (for our brain to decode) can be helpful in increasing the retrieval of information vital to conveying the Sound. Perhaps different types of noise would be helpful for different types of information: a regular repeating noise to improve rhythm, a repeating amplitude noise to improve dynamics, etc. Well, I am just thinking out loud now. But the idea that we can introduce specific types of noise or signal into a system to enhance capacity for information retrieval is very interesting. We only need to figure out what kind of noise to accomplish the tasks to do the experiment. In fig.12, the low-frequency sidebands indicated with a gray "5" lie at the ±75Hz subcode frame frequency; the ones indicated with purple numeric markers lie at ±17.6Hz and its harmonics. These sidebands appear to be associated with the 4716 transport. When I used the 4716 to drive other processors, these sidebands appeared in their analog output spectra; if I drove the 4715 with my usual PS Audio Lambda transport, they disappeared from the 47 Lab's output spectrum (though the data-related sidebands were as strong as before). The idea of analog randomanization. The VERY INTERESTING idea is that the introduction of noise as a dithering element for the analog signal (for our brain to decode) can be helpful in increasing the retrieval of information vital to conveying the Sound. Okay, what is that, and where can I hear it?